This is a ridiculously simple, fast and healthy lunch. I always have all the ingredients on-hand, and it is comforting to know that I’m always three minutes away from a truly delicious meal. Plus, I love tacos. In all forms. With any filling. And heating the tortilla in some butter or bacon grease adds an insane level of deliciousness. 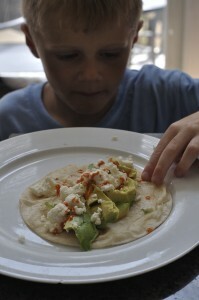 As a bonus: Mack LOVES these tacos! Even with the hot sauce! I can’t make just one for myself – he must have one, too! Heat the butter or bacon grease in a large skillet over medium heat. 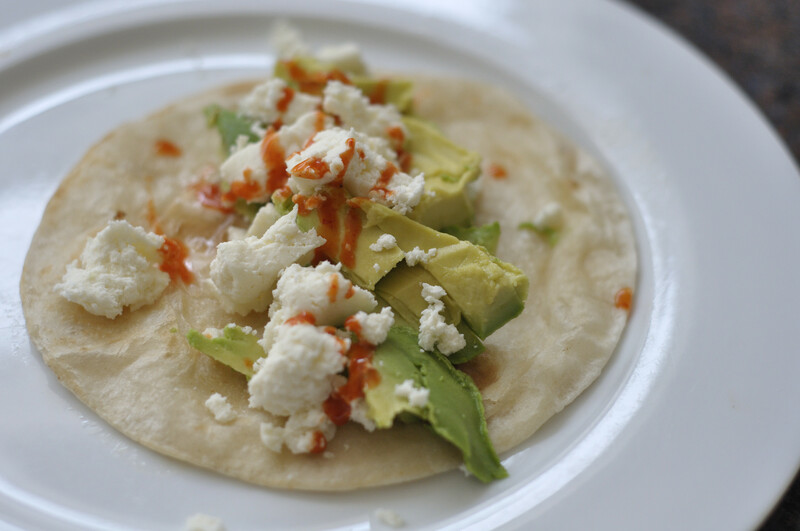 Toss in a tortilla and heat for 30 seconds. Flip. Remove and put on a plate. Top with half of the avocado and some crumbled queso fresco. Dash with hot sauce. Repeat with second tortilla. Yum! I just had the most delicious fried avocado tacos from a restaurant near where I live. A friend recommended them to me, and they were divine – and so simple!